Foxburg Fall Food, Art, and Crafts Festival - Go Foxburg! Flame-like leaves fill the branches of the multitude of trees lining the Allegheny River, and the air tickles the noses of anyone outside with a taste of the upcoming winter. 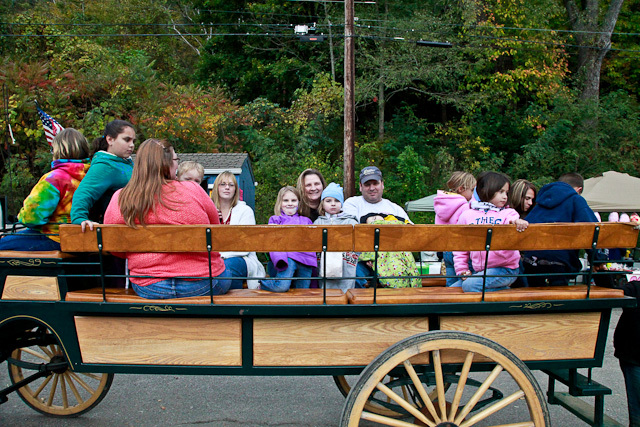 Another beautiful autumn is underway in Western Pennsylvania, and it wouldn’t be complete without Foxburg’s Food, Art, and Wine Festival. Delightful scents of warm fall apples, freshly popped kettle corn, and other favorite carnival foods fill the air as shoppers engross themselves in tent after tent of intriguing wares. The tinkle of wind chimes crafted from elegant antique forks serves as advertisement for one booth selling commodities fashioned from vintage silverware while another tent hosts a tailor selling gently used and vintage gowns and dresses, which can be custom fitted by the seller herself. Larger accommodations shelter a variety of handmade jewelry ranging from bold and funky pieces, only to be worn by the most daring individuals, to delicate and classy sets that add a layer of elegance to any fortunate finder. A small group of people gather around one certain booth. More join as others leave to create a seamless flow of observers to the tent’s activities. From their view in the crowd, the people observe an expert glass blower twisting and manipulating various colors of glass to create colorful works of art as his audience watches, their eyes glued to his steadily moving hands. 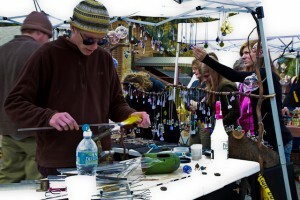 Many others are inspecting the tent’s unique contents consisting of pre-made glass items that are for sale. A makeshift stage is set up on The Foxburg Green, the grassy patch adjacent to the library that’s hosted many of the town’s open-air concerts, from which an assortment of musical artists play on the day of Foxburg’s Fall Festival. One performer’s instrument of choice is an acoustic guitar. 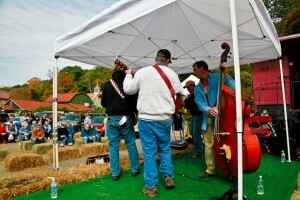 The bluegrass music that floats from the stage as he plays mixes with the familiar scents in the air to create a warm feeling of familiarity and comfort. Some members of the crowd linger beside the stage, dancing and clapping their hands when the perfect song comes along. Children clutch bouncy balloons as they run and play. They have their faces painted, hula-hoop, and participate in a coin dig. Parents there wear satisfied smiles as they watch the children playing, giving them a little extra time to socialize and explore the festival. 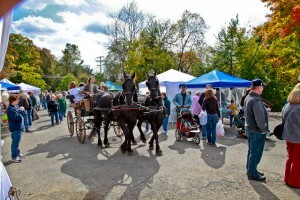 Foxburg’s Food, Art, and Wine Festival is an essential part of a Foxburg Fall. 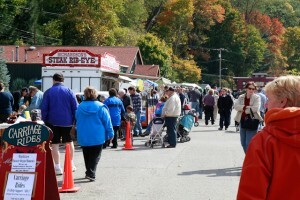 The excitement of the crowd visiting the vendors surrounded by auburn leaves that are tickled by the steam of delicious food thrill newcomers and welcome old memories of this season to those who have visited the festival in years past. 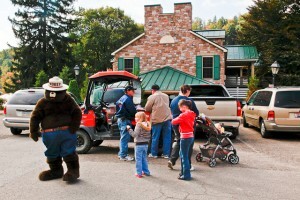 The Foxburg Food, Art, and Crafts Festival is the perfect place for anyone seeking autumn fun.